A team of pupils from Wicklow Montessori Primary School have been crowned the winners of the Learnit and DCU FIRST LEGO League Leinster finals. Over 20 teams from Leinster competed in the competition following four months of preparation, including the designing, building and programming of their own automated robots. Wicklow Montessori Primary School were crowned the 2019 Learnit & DCU FIRST LEGO League Champions and will now go forward to represent Ireland in the UK Finals in the University of the West of England, Bristol on Saturday, February 16th. Teams were tasked with developing a research project based on identifying a human, physical or social problem faced during long-duration space exploration within the Sun’s solar system and devised solutions to combat this. ‘For Inspiration and Recognition of Science and Technology’ (FIRST) and the FIRST LEGO League (FLL) encourages children to think like scientists and engineers, developing practical solutions to real-world issues. The FLL is an international competition involving students aged 11 to 16 from 80 countries. Teams of up to ten students and two adults can participate. Irish education specialists, Learnit, have introduced the FIRST LEGO League to schools in Leinster and Munster in recent years. DCU LEGO Education Innovation Studio (LEIS) works in partnership with Learnit with the aim of increasing STEM awareness in young people. Executive Dean of the Institute of Education Dr Anne Looney said that she was excited for DCU to hold the event this year. 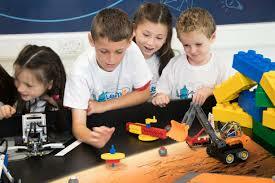 “DCU Institute of Education is delighted to host this event and to be associated with the FIRST LEGO Leagues. Working with our unique Lego Education Innovation Studio gives our student teachers a chance to work on practical robotic challenges, and to develop skills they can take with them into their future classrooms and a problem-solving mindset that can inspire the next generation of STEM learners,” she said. “The opportunity to be centrally involved in this initiative contributes to our goal of creating an interactive learning hub that will help DCU student teachers and Irish schools develop innovative and creative approaches to designing learning environments which ignite a passion for learning STEM (Science, Technology, Engineering & Maths) concepts and skills from early childhood education right through to third level,” said Professor Deirdre Butler of DCU LEGO Education Innovation Studio. “By adopting Lego®’s playful learning tools, with a ‘Hands-on Minds-on’ mindset, in a supportive learning environment, all students can develop key competencies such as creative thinking, problem-solving, team-working and communication,” she added.